An LCPD Police Patrol in GTA IV. The Police Patrol is a Declasse Merit modified for police service in Grand Theft Auto IV. In Grand Theft Auto: Chinatown Wars, it is depicted as a generic police car, possibly representing both GTA IV's Police Patrol, as well as the Police Cruiser. The Patrol is generally used as a patrol vehicle rather than a pursuit vehicle, due to it being slower and heavier than the Police Cruiser (the acceleration is about the same); despite its supposed role, the car is as common as the Cruiser, appearing relatively frequently as a traffic vehicle. 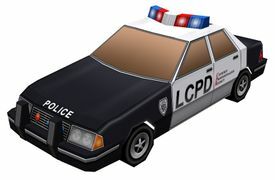 Like the Cruiser, the Patrol's livery is clearly based on that of the New York Police Department's vehicles, and is equipped with an interactive police computer. The Police Patrol's front is modeled after the eighth generation Chevrolet Impala Police Edition while the back is from the ninth generation. In GTA Chinatown Wars, the Patrol bears LAPD-style markings, rather than the NYPD style, making the car more immediately recognizable as a police car; the car also incorporate GTA IV's police computer for use in vigilante side missions. In cutscences, it is depicted with omitted rear quarter glasses. Pre-rendered in GTA Chinatown Wars, as depicted when the player is "Busted". A rendering of the papercraft "Police Car" from the GTA Chinatown Wars section of the Rockstar Games Social Club. 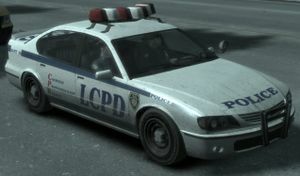 Although distinct from the Police Cruiser, the Patrol has "Police Cruiser" badging in GTA IV. The same badge is seen on the back of the actual Police Cruiser. Under the "Chinatown Wars" section of the Rockstar Games Social Club website, members may download a printable papercraft model of a "Police Car". The car's design is a cross between the police cars depicted in GTA III and GTA Liberty City Stories, as well as newer police cars seen in GTA IV and GTA Chinatown Wars. Like other emergency vehicles with a roof-mounted lightbar in GTA IV, the Police Patrol's siren will malfunction by wailing in random, distorted pitches if the strobe light housing is significantly damaged by gunfire, falling objects, or rolling of the vehicle. The second and third sirens noises are also disabled, leaving the car with only the malfunctioning siren noise. Under the lightbar, there may be a wiring hole that is found on the taxi models for the roof signs, possibly hinting the taxi variant was created before the police variant. This page was last modified on 4 July 2012, at 15:17.